Step out of Las Vegas with an excursion to Hoover Dam in Boulder City--about 50 minutes away. 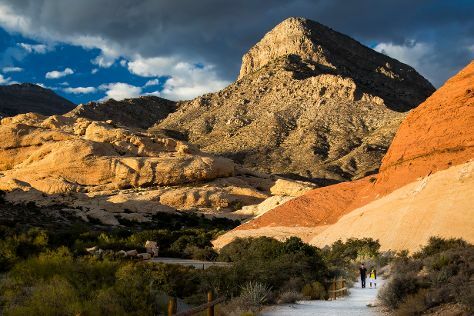 Next up on the itinerary: explore the striking landscape at Red Rock Canyon National Conservation Area, take a memorable tour with Tours, try your luck at Casino at the Venetian, and take in panoramic vistas at Eiffel Tower Experience at Paris Las Vegas. For ratings, photos, and other tourist information, refer to the Las Vegas day trip planner . Cairo, Egypt to Las Vegas is an approximately 20-hour flight. The time zone difference moving from Eastern European Time to Pacific Standard Time is minus 10 hours. Plan for slightly colder nights when traveling from Cairo in March since evenings lows in Las Vegas dip to 13°C. Finish your sightseeing early on the 5th (Tue) to allow enough time to travel to Grand Canyon National Park. On the 7th (Thu), hike the day away at Bright Angel Trail. Spend the 9th (Sat) exploring nature at Grand Canyon National Park. There's still lots to do: take in breathtaking views at Grand Canyon South Rim, take some stellar pictures from Mather Point, hike along South Kaibab Trail, and tour the pleasant surroundings at Rim Trail. To see maps, where to stay, reviews, and more tourist information, read Grand Canyon National Park tour planner. Getting from Las Vegas to Grand Canyon National Park by combination of car and flight takes about 4.5 hours. Other options: drive; or take a shuttle. The time zone changes from Pacific Standard Time (PST) to Mountain Standard Time (MST), which is usually a 1 hour difference. When traveling from Las Vegas in March, plan for a bit cooler days and much colder nights in Grand Canyon National Park: temperatures range from 16°C by day to -5°C at night. Finish your sightseeing early on the 9th (Sat) to allow enough time to travel to San Diego. San Diego is known for museums, zoos & aquariums, beaches, parks, and historic sites. Your plan includes some of its best attractions: admire nature's wide array of creatures at San Diego Zoo, examine the collection at USS Midway Museum, appreciate the history behind Cabrillo National Monument, and kick back and relax at La Jolla Cove. For other places to visit, reviews, traveler tips, and tourist information, go to the San Diego trip itinerary builder site . You can do a combination of bus and flight from Grand Canyon National Park to San Diego in 8 hours. Alternatively, you can drive; or do a combination of bus, taxi, and flight. You'll gain 1 hour traveling from Grand Canyon National Park to San Diego due to the time zone difference. Traveling from Grand Canyon National Park in March, expect nights in San Diego to be warmer, around 15°C, while days are a bit warmer, around 24°C. Finish up your sightseeing early on the 13th (Wed) so you can go by car to Los Angeles. Get out of town with these interesting Los Angeles side-trips: Anaheim (Disneyland Park & Disney California Adventure Park). Pack the 16th (Sat) with family-friendly diversions at Universal Studios Hollywood. There's much more to do: examine the collection at The Getty Center, take a leisurely stroll along Santa Monica Pier, look and learn at Griffith Observatory, and partake in some friendly competition at Fantastic Race. To find ratings, reviews, where to stay, and more tourist information, use the Los Angeles day trip planning tool . You can drive from San Diego to Los Angeles in 2.5 hours. Alternatively, you can take a bus; or fly. In March in Los Angeles, expect temperatures between 27°C during the day and 14°C at night. Wrap up your sightseeing on the 17th (Sun) early enough to travel back home.